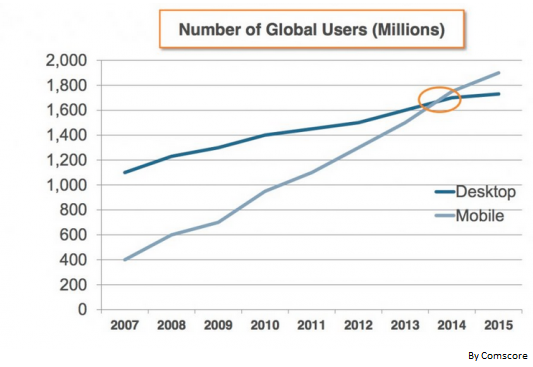 Mobile traffic is globally surpassing the desktop based traffic to web in the world. It’s no longer a case of asking whether mobile marketing important, we know it is! So when it comes to planning for a broad marketing outreach via mobile presence for your business or organization one of the considerations that will strike your mind is whether you want to develop a mobile website or to create a mobile application for users to download or perhaps you want to go for both. Mobile websites and mobile application can look quite similar at first glimpse. Though deciding which would be more suitable for your business or organization is an important part of the decision and the conclusion which would be suitable depends upon a number of factors, including target audiences, available budget, required features and intended purpose. Mobile website and mobile application both are accessed on hand held devices like iPhone, tablets, iPads, android phones etc. So before evaluating which one would be better let’s get deeper into the understanding the difference between a Mobile Website and a Mobile Application. A mobile website is similar to any website which is a browser based HTML pages that are linked together to be accessed over the internet. Like any website a mobile websites can display text content, data, images and video. A mobile website generally access mobile-specific features such as click-to-call (to dial a phone number) or location-based mapping. Mobile apps are actual applications that are downloaded and installed by users on their mobile devices. A user needs to visit operating system specific portals or stores such as Apple’s app store, Google Play Store etc. in order to download the application. The App may fetch the content form the internet as a website does, or it may even download the content so it can be available for accessing even when the internet connection is not available. If the goals of your organization or business are primarily related to public communication or marketing to acquire clients then a mobile website is possibly the best practical step that would make sense to your mobile outreach strategy. This decision can be explained with a straight reason that a mobile website has a number of advantages like its broadly accessible and compatible on all devices and is even cost-effective. A mobile website is instantly available for access to the users across all range of devices via browsers. On the other hand apps are required to be downloaded and installed from app market place before the content or application can be engaged which can be a significant barrier between initial action or conversion. 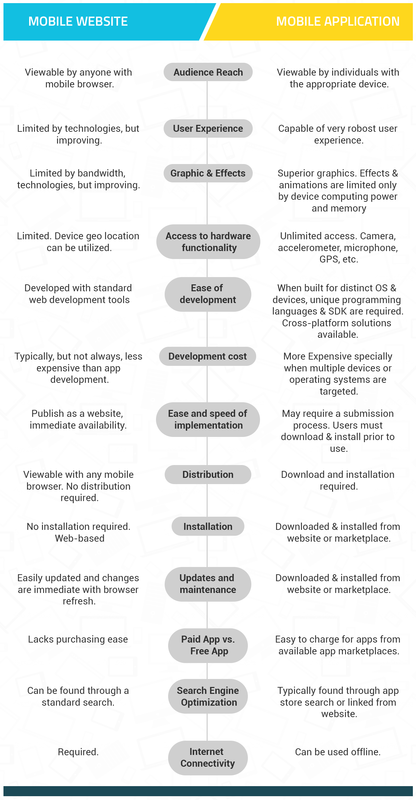 A mobile website has a reach across users carrying different types of mobile devices, whereas apps require a separate version to be developed for each type of device. Mobile website URLs are easily integrated within other mobile technologies such as SMS, QR Codes and NFC (near field communication). A mobile website is actually more dynamic than an app in terms of pure flexibility to update content. If you want to change the design or content of an app u need to push updates to your users to download it in order to update their app where as in case of mobile website you simply need to publish the updated version and the changes are immediately visible over the browser. Mobile website being mobile accessible versions of desktop websites have the same features as a normal website and so mobile websites pages can easily be found in search results. Most importantly, visitors to regular website can be automatically sent to your mobile site when they are on a handheld (using device-detection). In contrast, the visibility of apps are largely restricted to manufacturer app stores. Mobile websites URLs are easily rotated to users via links on message, e-mail, social media, blog, or even in print. An app can’t be made to reach to users in a similar and such an easier fashion. A mobile website accessibility across all platforms makes it easier to be shared among users as well as search engines. Development of a mobile website is considerably more time and cost-effective than development of a mobile app, especially if you need to have a presence on different platforms whereas in case of apps it requires development of multiple apps. The investment strategy in case of application and mobile website vary a lot because an app needs a lot of investment consideration as compared to mobile website. Application needs initial launch along with proper support, developing proper upgrades, testing, compatibility etc. When Does an App Make Sense for reaching mobile users across mobile? If it’s an interactive game an app is almost always going to be users best choice. If you are planning to target users so that they may download and use your application in a personalized way on a regular basis then a mobile application would serve to solve your purpose better than a mobile website. If the users you are targeting are going to use your application in a personalized way on regular basis then a mobile app is possibly the best way to approach. If your need is complex calculation or manipulation of data related to finance or investment etc. then an app will let you accomplish your task effectively. Mobile web browsers are getting increasingly good at accessing certain mobile-specific functions such as click-to-call, SMS and GPS. However, if you need to access a user’s camera or processing power an app will still do that much more effectively. 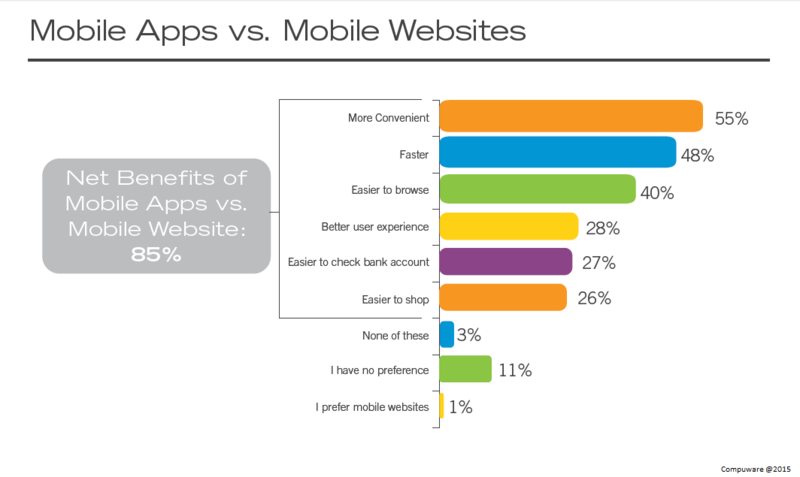 The “App vs Web” will remain a question of contemplation for organizations seeking to establish their mobile presence. If your organization’s goal is deliver content that can be shared between users and can be easily found on search engines to have a broad mobile presence and is primarily marketing-driven then a mobile website is the most reasonable choice. On the other hand, if your goal is to create active engagement with user and to provide an application that works like a computer program and not just a mobile compatible website then a Mobile Application will be required to fulfill your requirements.